President Moon Jae-in will cast his vote for the June 13 local elections early in case he is called to Singapore for discussions with U.S. President Donald Trump and North Korean leader Kim Jong-un. 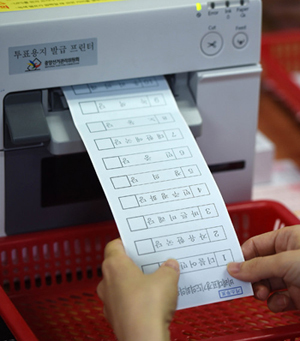 Cheong Wa Dae on Monday said Moon, his chief of staff Im Jong-seok, national security adviser Chung Eui-yong and chief policy adviser Jang Ha-sung will all vote early. Cheong Wa Dae spokesman Kim Eui-kyeom told reporters the aim is to "boost voter turnout" and has nothing to do with Moon's fading hopes that the Trump-Kim summit will broaden to include him for discussions of a peace treaty formally ending the Korean War. A Cheong Wa Dae official said, "We can't discuss the president's schedule while it is uncertain whether the U.S.-North Korea summit will end on June 12 or continue until June 13." Seoul has been pushing for a trilateral summit but has got no traction from the U.S. and North Korea. It is not even clear that China, which is another signatory to the armistice that ended fighting in 1953, will not also have to be included in formal peace negotiations.